I visited Babe’s at the Frisco location (6475 Page Street, Frisco, Texas) the first time in 2014. We were in Arlington, Texas where the 13-14 year old girls NFL Flag Football team my wife and I work with played in Cowboy Stadium for the National Championship (we came in second that year). Our team and parents had lunch at Babe’s one day. Babe’s Chicken Dinner House serves up southern, home style quisine. My wife and I visited the Babe’s in Carrolton a couple of weeks ago when we took a grand daughter to a dance convention in Dallas. It was every bit as good as what we remembered of the Frisco experience. We both had the fried chicken tenders. They were crispy and free of the grease that so often comes with fried food. Between the tenders and the sides we were stuffed and had a few leftovers. Babe’s has been around since 1993 when the first restaurant was opened in Roanoke, Texas. 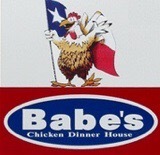 Now there are Babe’s in nine cities in the DFW area. All locations are family friendly with a casual atmosphere. The main dishes are fried chicken, chicken fried steaks, fried chicken tenders, smoked chicken and pot roast. All orders come with mashed potatoes with cream gravy, green beans, salad, cream corn and homemade biscuits – all served family style. The menu varies slightly between locations, but all have their great chicken. Meals are a little on the high side at around $15, but you certainly will not leave hungry. If you are in the DFW are and in the mood for a enjoyable, home style dining experience, Babe’s is a great choice.